It’s getting dark and distinctly colder. A half kilometer farther on, in the village of Chasserades, there’s a small hotel. We can warm up in there. We’re looking for a country stew or a cassoulet, and a bottle of vin du pays at the bar. Tomorrow will be another day. Esoterica: A good book to take with you when hiking in France is The Impressionists at First Hand, edited by Bernard Denvir. 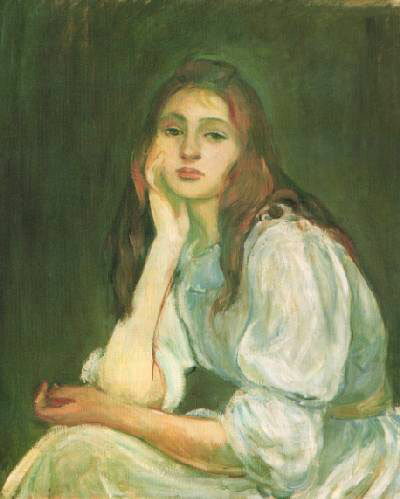 In it are excerpts from the journal of Julie Morisot (Manet), Berthe Morisot ‘s teenage daughter, who also happened to be Edouard Manet’s niece. Julie kept remarkable, insightful records on some of the Impressionists, including Renoir, whom she particularly admired. Most of these quotes are verbatim from Julie’s journal. I’m just a bit in love with Julie, too. 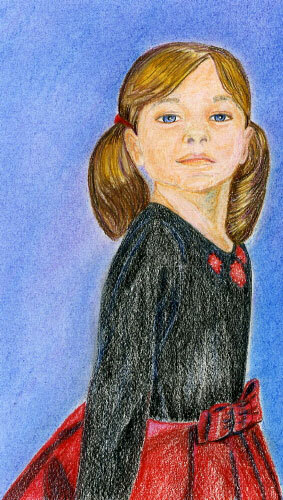 Unfortunately, her delightful journal ceases after her marriage to one of Degas’ students. I am so enjoying your letters from France. It brings back memories of my last time there about six years ago. I did a backpack through Provence, following Vincent’s steps through Arles, and then headed north to Giverny. 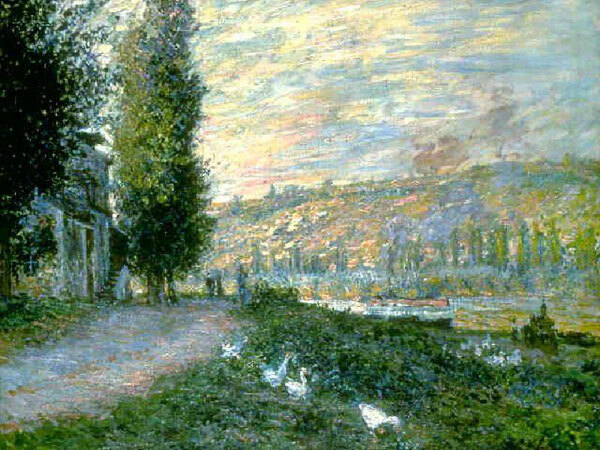 When I got off the train, I decided to walk the five or so miles to the Farm, and in so doing I felt as though I were Monet, or maybe he just walked with me, looking at the same sky, walking on the same dry, unpaved road, breathing the same air. The trees which lined the road were the same marching columns that appear in his paintings and the sky was suffused with late afternoon pinks and golds. I understood more about his paintings in that three hour walk than in years of studying. One of the most important elements to great paintings is to be completely and utterly besotted by your subject matter, to be in love with your medium, your colour choices, your process, and to paint this into the surface with unabashed passion. By doing this, the resulting product is almost irrelevant to the marvellous experience you will have engaged yourself in over the time period. However, hopefully, you will have transferred your intense passion onto your surface for others to palpate and enjoy. 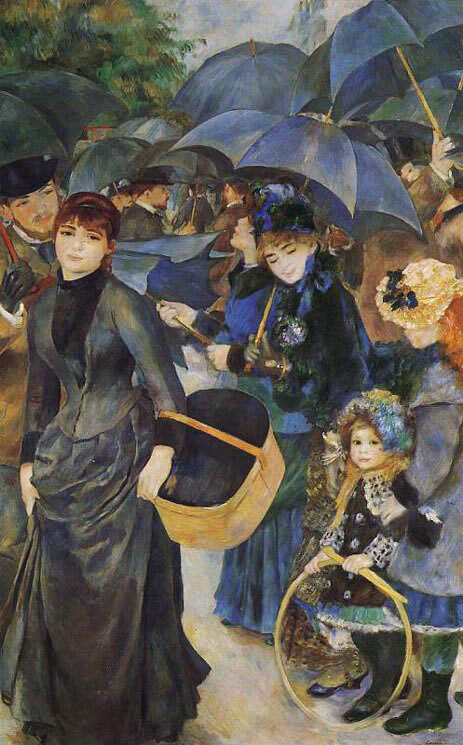 I must agree with Renoir that your painting needs to be a pleasure, otherwise why bother? Painting by rote or with pure boredom must effect the same feelings in the viewers. GET EXCITED about your works… dance your tools across the surface and re-live the pleasure you felt when you first found your subject matter. By allowing your senses to be ignited, a wonderful tingling pulsates, fostering a purely gestural responsiveness that yields expressive works. I had the joy and privilege of knowing Pierre-Auguste Renoir’s son, the great film director Jean Renoir. In one of those interesting bits of symmetry in life, my Italian wife Carla had got to know him before we met through a mutual friend in Paris, while I knew him through my father, former NY Times film critic Bosly Crowther. Carla and I visited Jean and his wife Dido at their charming home in Beverly Hills. To go there was to step out of time and place. Tucked away in a canyon, it was like being in a French provincial cottage. Jean was everything you described in his father, an entertaining raconteur, a wealth of information about every aspect of the arts and life, and a generous and supportive friend. Needless to say, the walls were dotted with his father’s work as well as the work of many great painters. 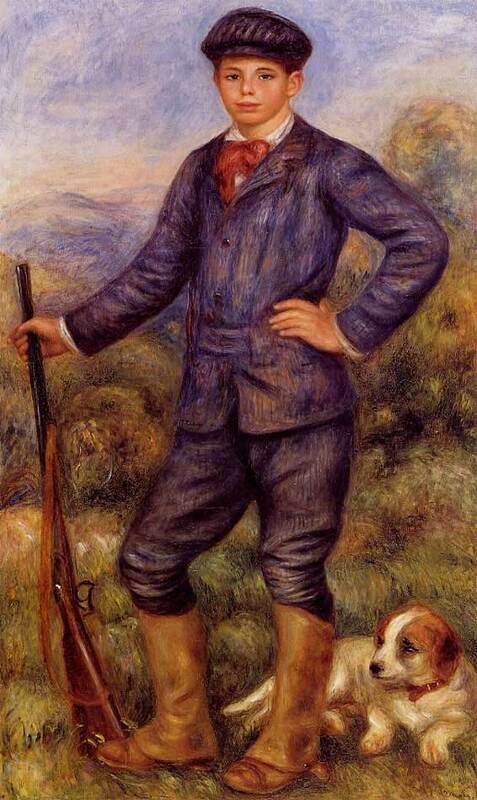 More recently I was at the Los Angeles County Art Museum and happened upon Renoir’s large painting of Jean at 15, dressed as a hunter. 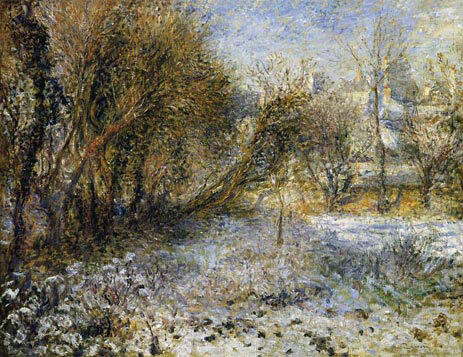 It was a strange and wonderful feeling, being connected in this mysterious way with the great 19th century Impressionists. I adamantly feel, as Pissarro did, that black should be banished from the palette. In true life, black is never black as in a tube of paint unless it is a hat made of wool and even that has shades. Shadows are the color they originally were, only dark. I don’t use grey either. I put red, yellow and blue together. I don’t have a tube of green either. What I do have is a big tube of white, a big tube of cobalt blue, assorted other blues such as phthalo and aquamarine. 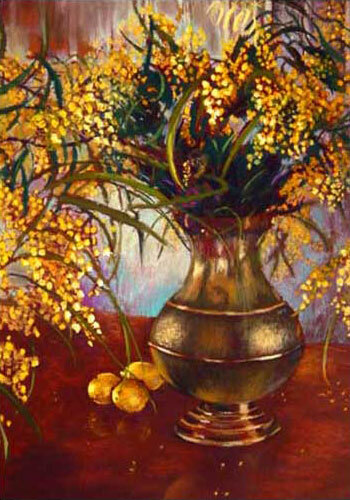 There are many different reds I enjoy, alizarin crimson, cadmium red, and shades of cadmium yellows and yellow ochre. Raw and Burnt Sienna and Umber. None of these colors are ever used directly from the tube. Each used in conjunction with another color to make a correct color. I just feel compromised by modern improvements. I get a sense of higher creativity when I create a color or what I need when it isn’t coming directly from the tube. I know there has been coal since the beginning of fire, but to paint a portrait of it, coal itself has shades and shadows. I am planning a trip to Paris in September, just booked it today. I have wanted to go there forever. My husband and I have been to Florence and Venice and are trying to go to Europe every few years. I am so excited and can not wait to see all the art and architecture. After our trip to Italy I did some fabulous paintings. I found Vivaldi in Venice. You could hear the music floating on the air a block away. We followed the music and there was a little museum dedicated to him. When I returned, I painted to his music for months. There are so many inspirational treasures to be found in travel. It is good to see history first hand and incorporate it into modern art. I am an abstract painter so I was very happy when we went to the Guggenheim in Venice. 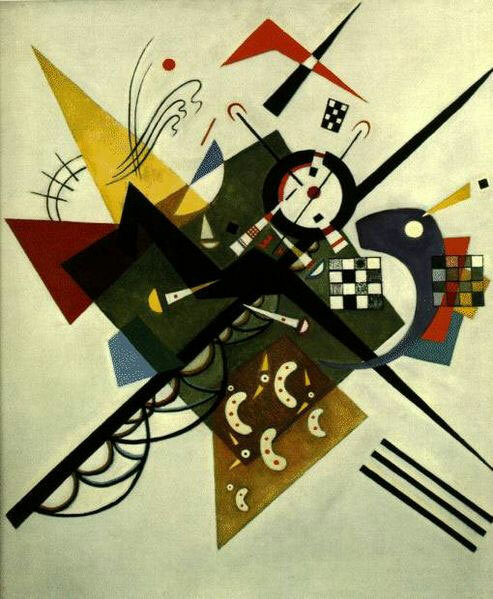 They were having a special exhibition for Kandinsky, one of my favorite artists, both in his philosophy of spirit and his painting. He wrote a great book called Concerning the Spiritual in Art. Georgia O’Keeffe studied this book in her earlier years. Travel has had a huge influence on my art, always for the better — stimulating and fascinating — and, tax deductible. 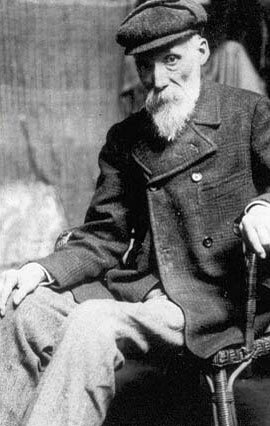 My Grandfather, from Nova Scotia, built homes with the devotion of the men and women of Renoir’s era. He came to the United States straight from the family farm, learned his carpentry trade, and worked, building homes by hand and hammer, with at best a 4th grade education. He and my grandmother made their life in Pasadena, California, and he built homes throughout the state. They were rich in life, although not in cash. He made a dollar a day when he was working. In response to the Industrial Revolution, the artists and thinkers of Grampy’s time created the Arts and Crafts Movement. These leaders believed in human effort and appreciation for their daily work. These artists had an authentic and meaningful search for style. I know first hand that these men believed in what they were trying to do, even through a devastating economic depression. Throughout the times, my grandparents somehow held on to their belief in the beauty of life: the pain passed, and the beauty remained. They retired in our beloved Laguna Beach, in a cute little home they bought for $5000 in 1950. It’s up for sale these days for $1.5 million. 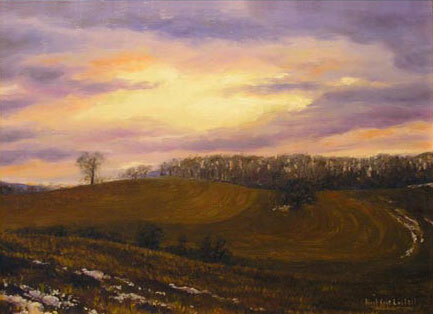 I still paint there when I go, albeit a fluid, flowing style — not fuzzy, and no hard edges for me. That is my pleasure. I enjoy pretty paintings, and I make them. We can never have too much beauty in our world. It keeps us, heals us, and gives much to us. 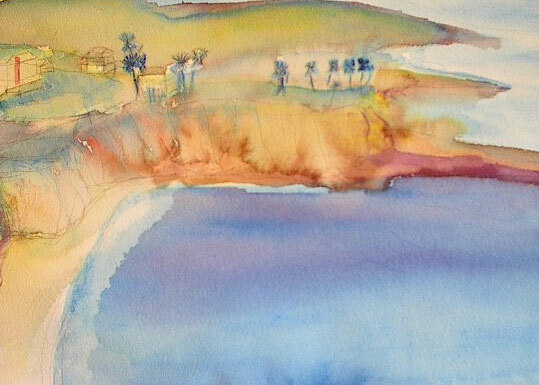 I hike on the soft sand, luxuriate in the warm sun, and the hardest edge I get to is to lean against a eucalyptus tree while I paint the people and the waves of my first home in this world. I have often thought that a book of carefully chosen quotes by artists could easily be one of the greatest collections of philosophy ever assembled. Why? Because I believe that artists of all kinds — writers, poets, painters, musicians — balance on a unique crossroads of human inquiry and understanding. Scientists mostly take the world apart and study it in tiny, testable pieces and try to make sense of the whole from the pieces. Philosophers (in the traditional sense) contemplate the whole and try to apply the broad understandings they’ve gleaned to specific questions and situations. A true artist, though, must nurture an intimate understanding of both the whole and the parts. 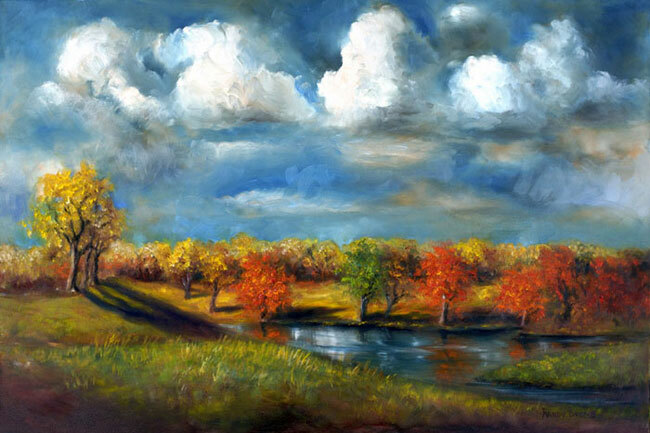 You cannot paint a forest well unless you see and understand its entirety, with its relationship to the surrounding land as well as the unique lighting and conditions of the day. But to truly paint that forest, the more you notice and know of the individual trees within it, and of the kind of clouds that dot the sky above, and of the specific characteristics of the pigments you are mixing on your palette to render the scene, the better. The same kinds of things hold true in painting a portrait of a fellow human being. And all of those understandings of the physical world around us, born of our need to carefully observe, ponder, and then recreate through our chosen medium, in turn have moral, emotional, and spiritual implications for our existence. That is why I believe artists have always had a valuable role to play in any society’s philosophical and moral health and development. 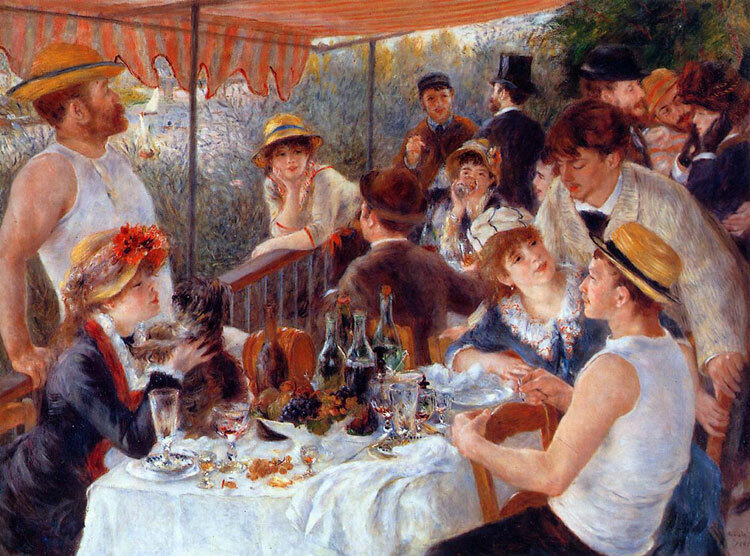 As a musician, reading about you and Renoir, I thought of how, now in the days of iPod etc., one can indeed take the music anywhere. But, again as a musician, I lament the ubiquitous nature of “canned” music in today’s society. I’m not sure how it is where you are, but here in the U.S. you can’t go out to eat, shop, or even sometimes relax at a resort without being constantly bombarded by generally loud pop music that has no meaning or relationship to the place (unless you consider Jimmy Buffet at the resort to have a relationship). Especially annoying to me is an ethnic restaurant that plays American pop music from some satellite radio rather than, say, Italian or French or Asian music. To my way of thinking, this practice forces people to “tune out” the music, and reduces music’s overall value as an art form. Of course, canned music can’t replace the palpable energy and emotional impact of live music anyway. As a musician who plays in a hospital setting (Shands Arts in Medicine in Gainesville, Florida), I have experienced the powerful healing effect of music on many occasions. But I sometimes find myself envious of the visual artists in our program, whose art results immediately in an actual physical product that can be seen and even kept by the patient. Music, unless it is recorded, mostly just disappears into the ethers. But in this setting, its effect can linger long, and even be visually noted in machines that monitor blood pressure, heart rate and other indicators of patient health. Along these lines, when I’ve seen original artwork by the great masters in museums, I have been fascinated by the tangible energetic presence that often emanates from the canvas. It seems that these artists somehow manage to impart a piece of their soul onto the canvas that can actually be felt by the observer. I find it especially palpable when standing in front of a Picasso or a Van Gogh. My friend Christine, a virtuoso flute player who moved here from France, told me an amazing story of playing for children in France who were hearing-impaired. While she was there at the school, the teacher also played two recordings of a piece of music, the same piece done by two different artists. The children responded much more, with physical swaying, sounds, and emotional facial expressions to one of the two pieces, which she described as being far more expressive, while both were very well-played. As we are both involved in the healing aspect of the arts, this led us into many conversations about the concept of artistic Intention and how it gets translated through these electronic mediums in some way — much as the energy of the visual artist gets transferred onto the canvas. And also Eugene Mendonsa who wrote, “I am writing an art book and looking for quotes from female artists or women who were connected to the art world. Ninety nine percent of the quotes I find are from men. Any suggestions?” (RG note) Thanks, Eugene. There are tons of quotes by women artists in our Resource of Art Quotations.